Sieve the gram flour, salt, asafoetida and turmeric powder together in a bowl. Grind the ginger and chilli into a smooth paste and mix in the above flour mixture. Add, beaten curd, water and sugar together into a smooth and thin batter. Keep a large plate and smear oil on it. Heat oil in a pan and add the prepared batter to it. Keep the flame low and stir continuously until the batter is well cooked. The batter would become slightly thick and glossy once it is cooked and would not stick to the walls of the pan. The batter should still be in a semisolid consistency. Pour the contents immediately on the greased plate and spread the batter evenly into a thin sheet using a ladle. Once it is spread make even sized strips using a knife. Roll each strip into spirals and place them on the serving plate. 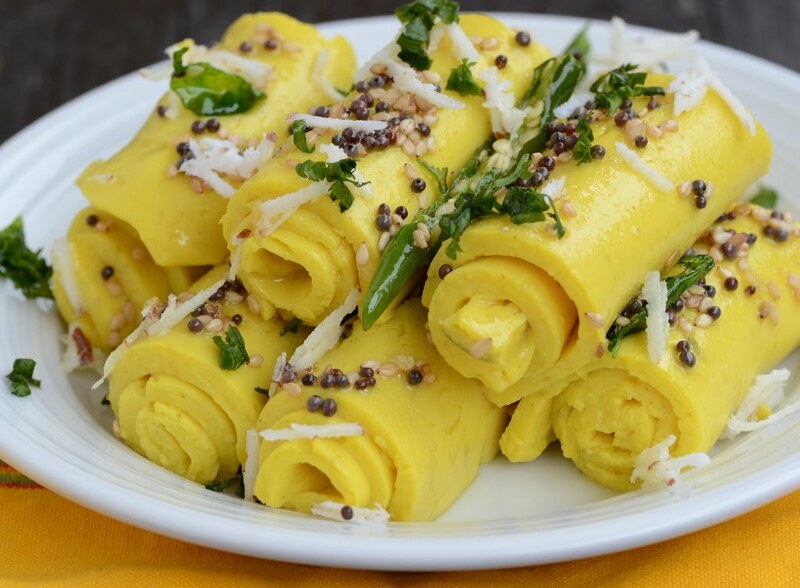 Crackle mustard seeds in oil and pour them on top of the rolls and garnish with scraped coconut and finely chopped coriander leaves. Recipe courtesy: 4 th sense cooking.